At home or on the go, accidents always happen at the worst times but Celox First Aid products can help to get control of bleeding injuries. 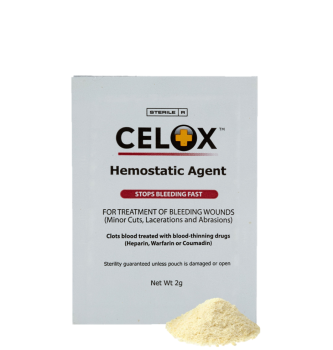 FDA cleared, Celox Granules work fast to stop bleeding from minor cuts, lacerations and abrasions. Celox products are lightweight, compact and affordable – perfect for the kitchen, at the workbench, sports, hobbies, camping and whenever you are on the move. Stop bleeding from minor cuts, lacerations and abrasions at home, at work, for leisure, for travel. Be prepared with Celox First Aid Hemostatic Gauze Products. Accidents happen. Injuries happen. Celox works. Stop bleeding from minor cuts, lacerations and abrasions at home, at work, for leisure, for travel. Be prepared with Celox First Aid Granules.